This month’s Daring Cooks’ challenge is “Healthy Potato Salads from Around the World!”, and the timing couldn’t be better! This gave me a perfect opportunity to morph the classic Indian “Aloo Gobi” into a fresh potato salad! Instead of drowning the potatoes in mayonnaise, I’ve made a spicy and bright dressing with yogurt. 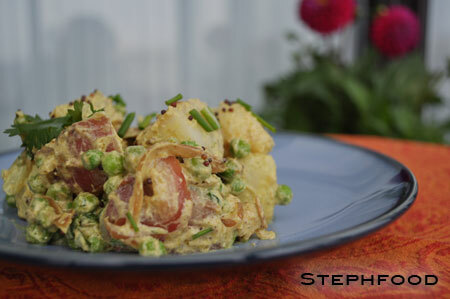 If you like potato salad, and don’t shy away from fun spices, you will love this! 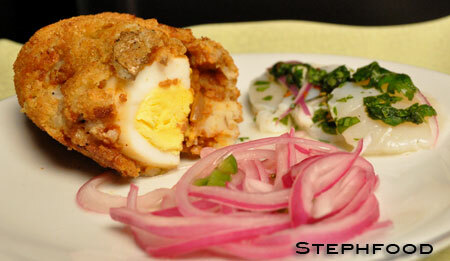 This month’s Daring Cooks challenge takes a stab at Peruvian cooking. I guess the moral of the story is that if you want something, get off your duff and try to make it yourself! Potato salad is one of those typical summer things. I love a traditional potato salad, full of cooked egg and mayo, but sometimes you want something a little different. This potato salad contains no mayo, instead using deliciously tart yogurt for the creamy dressing. Like the traditional, this salad gets much flavour from mustard, but this time using grainy mustard for added texture. To top it off, some fresh tarragon (from the garden! woo!) and sour green apples give it a little kick. When I first made this dish, modified from one we saw on TV many many years ago, I used Kozlik’s “Sweet & Smokey” mustard, purchased from the St. Lawrence Market here in Toronto. I don’t happen to have any on hand this time around (if only I had planned this in advance a little! ), so I’ve added a couple of sweet & smoky elements to make up for it. If you are lucky enough to be able to find Kozlik’s mustards, I highly recommend using “Sweet & Smokey” in this recipe. 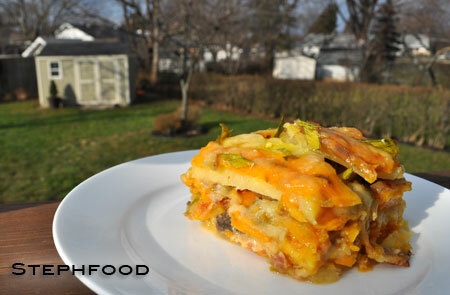 This dish reminds me of the first time I had the salad that serves as inspiration for this one. It was made for my university graduation, alongside some incredible grilled portabello mushrooms. That version of the salad had mayo, and a few other differences that I can’t recall (it really has been that long…), but it was a great starting point for me to explore alternatives to ye olde potato salad. I’ve been making it ever since.